Mitsubishi Technology-Information about the Mini-Split Ductless System. – All Weather Mechanical Inc.
For more than 30 years, Mitsubishi Electric has been a leader in the United States in providing the most energy-efficient, environmentally friendly HVAC products. Mitsubishi Electric’s advanced technologies include INVERTER-driven compressor systems which use only the exact amount of energy needed to cool or heat an area. This feature provides users with energy and costs savings while experiencing precise control over their personal comfort year-round. Split ductless, low-profile ducted and multi-position ducted systems use refrigerant lines to connect outdoor units to indoor air handlers. The result is the capacity within any space with an indoor unit installed to be controlled providing the perfect temperature. Mitsubishi Electric systems also offer the unique ability to condition only those spaces in use at any given time. Mitsubishi Electric’s systems employ user-friendly wireless hand-held, wireless wall-mounted, or wired wall-mounted controllers. These options deliver precision control to efficiently provide personalized comfort. Zone control coupled with personal control equals all-around energy savings. Hot-start: The indoor unit’s fan only blows air when the coil has warmed to the desired temperature. An energy-saving measure, it also prevents drafts of cold air at start-up. 3D i-see Sensor™: This sensor scans the room and adjusts temperature and airflow automatically maintaining consistent comfort by eliminating cold and hot spots. H2i® Technology: Hyper-Heating INVERTER (H2i) technology is designed to provide comfortable indoor temperatures in extreme cold-climate conditions (as low as -13° F) while saving energy and money. Zone Control: Why cool or heat rooms you don’t use? Why sweat or shiver in those you do? Zone control allows you to optimize the temperature of any space with an indoor unit to save energy and reduce costs. Create your own perfect comfort zones! Quiet Operation: Indoor units run quiet as a whisper and outdoor units run quieter than a refrigerator. Enhanced Filtration Systems: Washable filters last up to 10 years and remove pollen, dust, dander and other allergens that reduce indoor air quality. Each room has its own filter to ensure pristine air. Individual units allow you to regulate temperatures in the spaces you use. A toasty warm family room in winter; a fully air-conditioned sunroom in the summer; a functional basement or garage all year long. By optimizing the temperature in selected zones, you can achieve the level of comfort you want while decreasing energy consumption. You can even set each room to a different temperature (within the same mode of heating OR cooling) to make each member of the family happy. Mitsubishi Electric is consistently recognized by HVAC contractors as the #1 preferred ductless brand with the highest quality rating among manufacturers. Mitsubishi products provide extraordinary service and perform years beyond the norm. 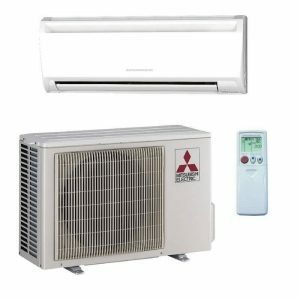 As a Mitsubishi Electric Elite Diamond Contractor, we can provide a personal system configuration based on your needs. Click the Mitsubishi tab on our website awmhvac.com or call us at 910-330-5617 to speak with one of our expert technicians.